JWMI is also recognized by CEO Magazine as tied for the top global online MBA program in North America. 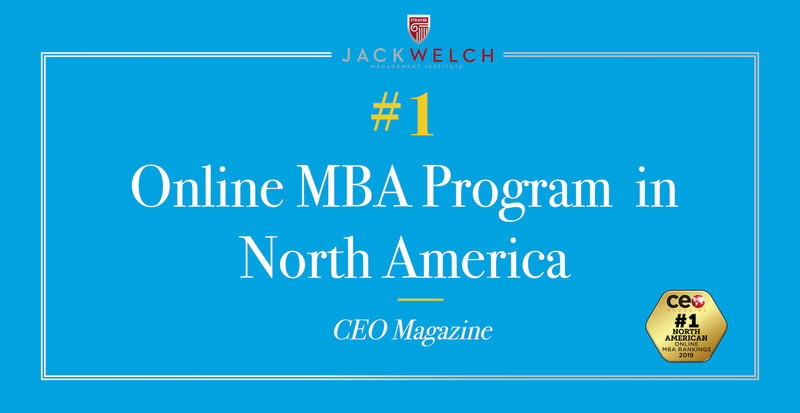 WASHINGTON, March 20, 2019—The Jack Welch Management Institute (JWMI) once again ranked highly among global online MBA programs by CEO Magazine, moving up several spots to #10. In the magazine’s 2019 rankings release, JWMI also tied with the University of Denver for the top global online MBA program in North America. This is the seventh year the program has ranked on the CEO Magazine Global Online MBA Programs list. “The recognition that the Jack Welch Management Institute continues to receive is extremely rewarding. We take great pride in knowing that our students are receiving a diverse learning experience that will set them up for career success,” said Dean Sippel, CEO of JWMI. The prestigious list separately ranks traditional MBA, Executive MBA and Global Online MBA programs—using fact-based criteria—to help students best pick the school that fits their career readiness profile. By looking at more than 270 business schools, 47 of them global online MBA programs, and gathering information on the programs—including accreditation, quality of faculty, price, professional development, international diversity and exposure, class size, faculty-to-student ratio, work experience, gender parity, and delivery methods—CEO Magazine identifies quality schools that yield a great return on investment. JWMI currently enrolls a diverse population of more than 2,000 students and has a growing alumni network of approximately 1,500, representing 47 U.S. states and 56 countries. JWMI caters to working professionals looking to transform and accelerate their careers. Named one of the Top 25 Online MBA Programs for 2019 by the Princeton Review, JWMI offers an online MBA program that is specifically designed to drive business insights that can be applied immediately, helping students become better leaders while accelerating their careers. To learn more about the Jack Welch Management Institute, visit http://www.jwmi.com or follow @JackWelchMBA on Instagram. Founded in 1892, Strayer University is an institution of higher learning for working adult students. It offers undergraduate and graduate degree programs in business administration, accounting, information technology, education, health services administration, public administration, and criminal justice. Strayer University is accredited by the Middle States Commission on Higher Education, 3624 Market Street, Philadelphia, PA, 19104 (267-284-5000, www.msche.org). The Commission is an institutional accrediting agency recognized by the U.S. Secretary of Education and the Council for Higher Education Accreditation. For more information, visit www.strayer.edu.